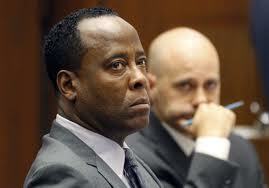 Dr. Conrad Murray was found guilty of the involuntary manslaughter of Michael Jackson today in court. He was then handcuffed and taken to jail where he will be held without bail until his sentencing on November 29. After they announced the verdict MJ fans outside celebrated and the overall consensus was people agree with the verdict. Do I agree...uh, yeah. The dude was a hella enabler, but people need to remember that MJ played a part as well. It wasn't all Dr. Death.